quite the nicest kind of beans on toast. Pod the broad beans, putting the large ones in one bowl and the smaller ones in another. Bring a large pan of water to the boil. Add the large beans, let the water return to a simmer and cook for 1 minute. Add the small beans and simmer for a further minute, 90 seconds tops. Drain the beans. Pop the large, thick-skinned ones out of their skins. Very small beans don't need to be skinned. Place a frying pan over a medium-high heat, add 1 tablespoon of oil, then the bacon. Cook until just starting to crisp, then add the spring onions and cook for a minute longer. Tip in the beans and toss to combine with the bacon and onions. Add lemon juice, salt and pepper to taste. 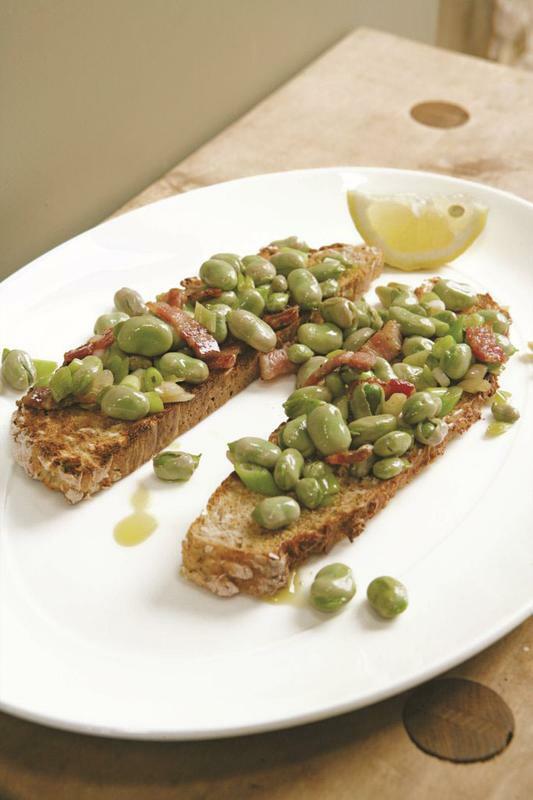 Toast the bread and spoon the broad beans and bacon on top, along with any pan juices. Trickle with a little oil, add a final squeeze of lemon and serve. Replace the bacon with a similar quantity of good pork sausage. Remove the skin from the sausage, tear the meat into lumps, then fry it until crisp, breaking it down into nuggets and crumbs as you do so. Add the spring onions and beans and finish as above.